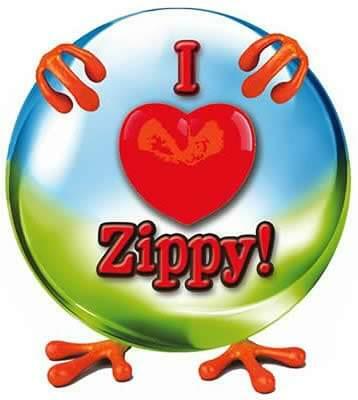 Buttons for all of Zippy's biggest (and smallest) fans! Yes, we have heard you telling us how much your kids enjoy Zippy Toad (hero from Recorder Classroom magazine) and his wacky tunes, so we thought we would help you add extra zing (or maybe we should make that "Boing!") to your recorder program. So we created some very cool, full-color buttons and stickers to use as rewards and/or energy boosters with your students. The colorful illustration - shows our hero Zippy holding up a big, 3-D, watery-looking globe in nice shades of blue and green, and on that is the 3-D saying, in bright red, proclaiming love for everyone's favorite singing (?) toad. We think kids will enjoy it on their music folder, book bag, tote bag, ball cap, backpack, or in their room at home.